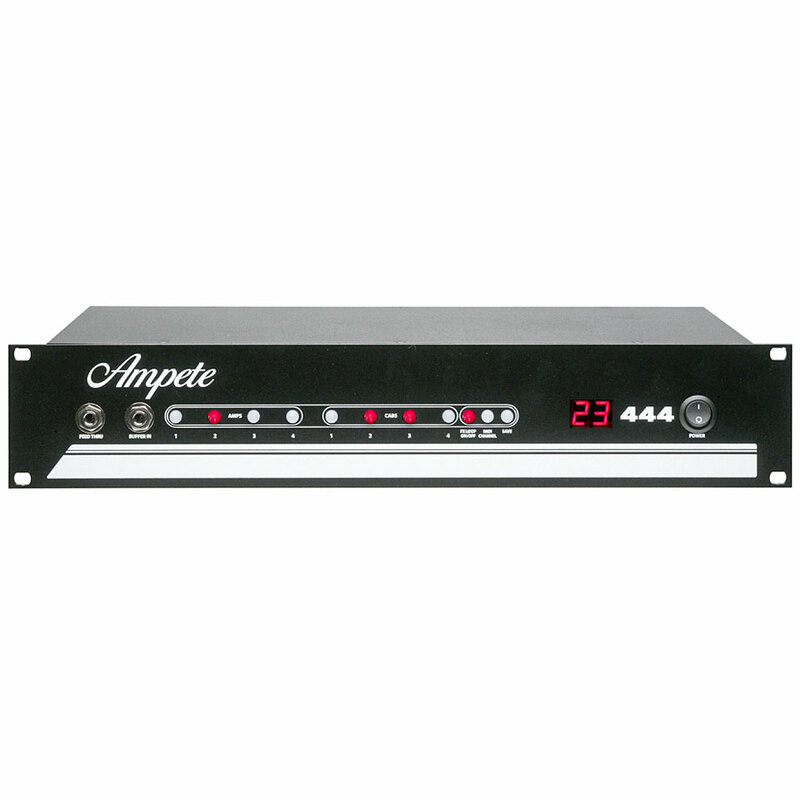 The Ampete 444 (zuvor Spyder) is the first in a series of Amp and Cabinet Switching Systems that gonna change the game! The 444 is the first complete switching solution right out of the box. If you are a well equipped guitarist and sound enthusiast, a touring Pro Musician, a Studio Engineer, or just a gearfreak as we are - who’s not willing to swap his beloved tube amps against one of those soulless, simulating, digital boxes out there - this surely is the missing piece in your arsenal! Don’t read any further if you are looking for a handy all-in-one amplifier. 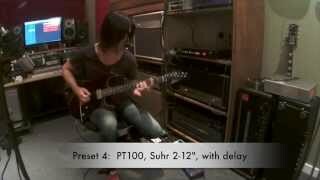 If you have several amps and cabs, and love them all for a reason? Let's say... that Boogie for the rich and chimy clean sound, that Friedman for the tight and overwhelming rhythm, that Diezel for its heavy chunk and that Bogner for that singing leads... that open 2x12 for bringing out the best of your clean sound, those 4x12 Greenbacks out of your crunch, don't wanna miss that aggression of those V30's or the extra bit of flavour of those Scumbags? The Ampete 444 let you switch between any of those combinations with a flip of a switch! 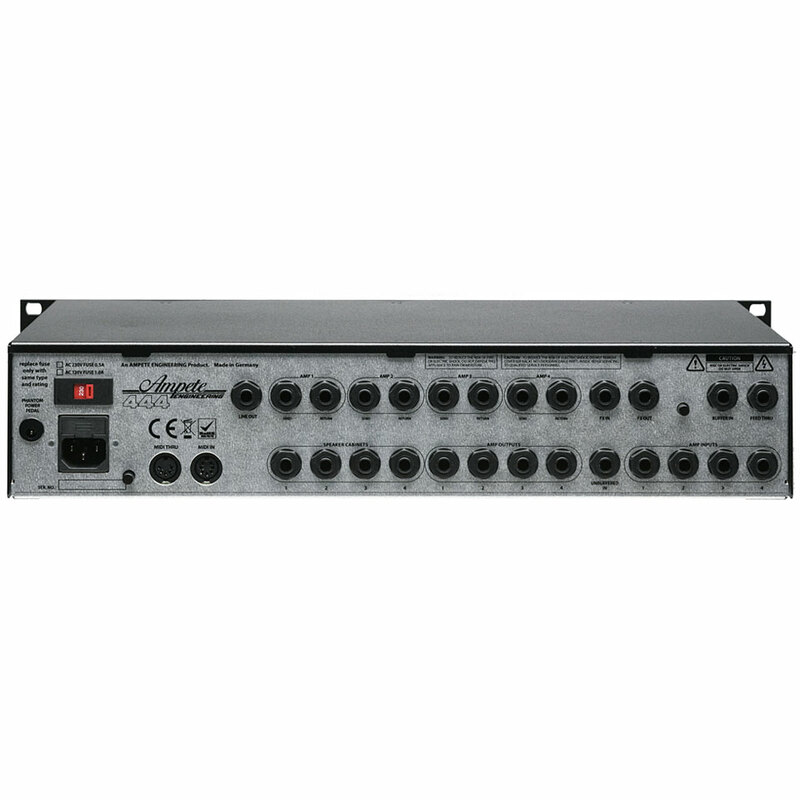 Choose from any of the 4 capable Heads (1 at a time), combine it any of the 4 capable Cabs (up to 2 at a time). If you know what "GAS" is, if Bob isn't just a name for you, if you ever tried to spell Skrydstrup correctly, or ever realized a dried mouth after hours of watching pictures of Friedman built Racks and Pedalboards, you probably saw some of the most advanced and impressing Rigs... The Ampete 444 is your chance to get Amp-Part of the fun, right out of the box! Dave Friedman of Rack Systems and Friedman Amplification: "This is the coolest thing I EVER saw! " Chris at ENGL Amplification: "Great tool, gonna use it to compare the different design stages for new amplifiers! " Bei diesem Gerät wurde an alles gedacht. Endlich ein Amp-Switcher, bei dem auch Effektloops mitgeschaltet werden. Der Schaltvorgang ist knackfrei und schnell, die Amps klingen genauso, als würde man Gitarre und Box direkt anschließen, d.h. die verwendeten Buffer sind von sehr hoher Qualität. Dieses Gerät braucht sicherlich nicht jeder Mensch, zumal zu dem gebotenen Preis. Aber wer mehrere Amps sein eigen nennt, und sie in sein (Live-)Setup einbinden will, braucht den Spyder. Sicher eher ein Gerät für den Profi oder den sehr anspruchsvollen Hobbyisten. Klanglich, verarbeitungsmäßig und funktional geht es jedenfalls nicht besser! · Alle Artikel der Marke Ampete anzeigen.